Our toffee is said to be the best in Denver and when you try it we are sure you’ll agree! We have a variety of flavors including Almond, Cashew, Macadamia Nut, Pecan and unique seasonal favorites like Pumpkin Spice. Each batch of toffee is made with all the freshest ingredients and no preservatives, which brings out an incredible buttery toffee flavor in each crunchy bite. We combine our secret toffee recipe with the “nut” of your choice and then layer it with our high quality dark, milk or white chocolate. 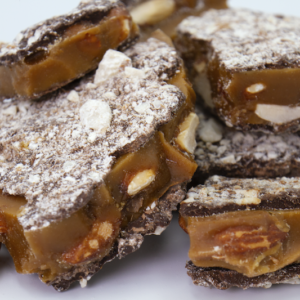 Our toffee is available in quarter- pound and half pound packages, or you can special order a larger quantity.